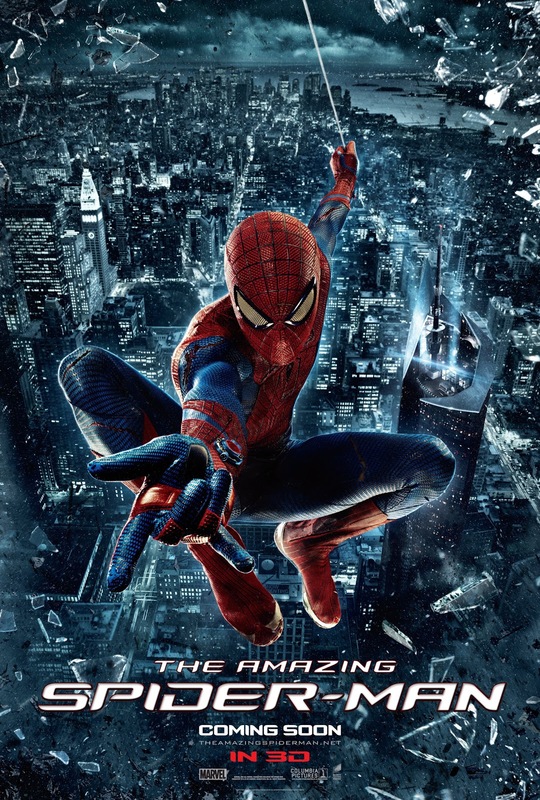 Shivom Oza: The Amazing Spider-Man (2012) Review by Shivom Oza - The Web-Slinging Superhero Amazes, Yet Again! 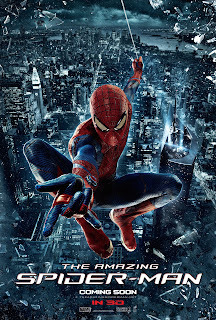 The Amazing Spider-Man (2012) Review by Shivom Oza - The Web-Slinging Superhero Amazes, Yet Again! ‘Friendly Neighbourhood Spider-Man’ is back yet again, in a new avatar, featuring an all-new star-cast as ‘The Amazing Spider-Man’. This film stays rooted to the Marvel comics and does not experiment much. So, you have Gwen Stacy and not Mary Jane Watson as Peter Parker’s girlfriend. Peter’s father Richard Parker plays a very important role in the franchise (Yes, the sequel is very much ON! ), and the antagonist of the story is Dr. Curt Connors (Lizard) and not Norman Osborn (Green Goblin). Leaving aside all the aforementioned factors, the soul of ‘Spider-Man’ (2002) and ‘The Amazing Spider-Man’ (2012) remains the same. Peter Parker (Andrew Garfield) is an outcast high school student, deserted by his parents as a boy and raised by his Uncle Ben (Martin Sheen) and Aunt May (Sally Field). Like most teenagers, Peter is introspective; trying to figure out what made him the person that he is today. He is also smitten by his school mate Gwen Stacy (Emma Stone). Peter gets hold of an old briefcase that belonged to his father Richard Parker, hidden away in his Uncle’s basement. This leads him to Oscorp and his father’s former partner Dr. Curt Connors (Rhys Ifans). The mystery deepens as Peter’s life changes along with Connors’ owing to cross-species genetics. What follows is a battle of might between ‘the masked vigilante’ Spider-Man and the horrifyingly gruesome ‘Lizard’. Talking about the casting, comparisons with the original silver screen ‘Spider-Man’ Tobey Maguire are inevitable. No one can take away any credit from Maguire’s performances in the three ‘Spider-Man’ films. He has been the ultimate web-slinging superhero for an entire generation ever since the first film hit the screens in the year 2002. You wouldn’t imagine any actor taking his place in this franchise for a long time to come. However, Andrew Garfield (who has shone as an actor in films such as ‘Boy A’ and ‘The Social Network’) comes off as a pleasant surprise. He provides edginess to the character, yet manages to retain the inherent introvert in Peter Parker. While watching the film, you would wonder how Tobey would have pulled off a particular scene, but thankfully Garfield holds his own. It must have been a tough predicament for Garfield to step into Spider-Man’s shoes (and suit! ), but he does well and how! Emma Stone is brilliant as the gorgeous, spunky and extremely intelligent Gwen Stacy. It wasn’t a difficult role to pull off. However, it was lengthy and significant, and Stone does a marvellous job! If you thought Kirsten Dunst was the one blip on the radar in the previous franchise, Emma is spot on, and her chemistry with Garfield (also her alleged beau) is electrifying. The antagonist Rhys Ifans, who plays Curt Connors, the scientist with the amputated right hand (he likes to call himself a southpaw! ), impresses. The writers could have done so much with his character. For instance, make it more negative. However, they let CGI (Computer-generated Imagery) do that job with the ‘Lizard’. Martin Sheen as Uncle Ben doesn’t make as much of an impact as Cliff Robertson did in Sam Raimi’s 2002 version. Sally Field as Aunt May also, is not given much prominence. Her scenes have been thrown in haphazardly. They could have certainly shown more of the Parker couple. Finally, our very own Irrfan Khan also features in the film. Although the length and the significance of his character (Rajit Ratha) is little, the actor could have done much better. Yes, it is a proud moment to see an Indian actor play a prominent role in a big-ticket Hollywood blockbuster. However, it hurts to see such a brilliant talent speaking in a weird accent, trying to fit into a role that does not belong to him. Irrfan should have let this role go; rather the casting department should have been aware of his English speaking skills. Talking about the writing and the direction, the first half does make you yearn for the old Spider-Man to comeback. You wonder why they had to tamper with a franchise that culminated as recently as in 2007 (‘Spider-Man 3’). Director Marc Webb of ‘(500) Days Of Summer’ fame manages to inculcate in this film, contemporariness, and succeeds. The team of writers have stayed as rooted to the works of Stan Lee and Steve Ditko, as possible. Sam Raimi added his own touch to the hugely successful comic superhero and Webb provides it with his own edge. As already mentioned, the comparisons are inevitable. The CGI is phenomenal in the film. Scenes featuring Spider-Man and Lizard look amazing on the big screen. 3D is average, watching the film on 2D wouldn’t make a difference. The film relies heavily on the visuals, and delivers. James Horner’s music is great, though not memorable! Overall, the film is an enjoyable ride. It’s a delight that it releases in India before most other places in the world! The ‘Spider-Man’ franchise of Sam Raimi and Tobey Maguire is still watchable, even after a decade. Can’t say if one would watch ‘The Amazing Spider-Man’ in 2022, but in 2012, you should definitely give it a shot! I am a fairly opinionated person. So, I write! All film reviews posted on this blog (May 2012 to June 2013) are from www.movietalkies.com, written by the same author. These articles may not be reproduced in their entirety without permission. Yeh Jawaani Hai Deewani (2013) Review by Shivom Oza – Kuch Zyaada Hi ‘Lambi’ Kahaani! Mere Haule Dost (2013) Review by Shivom Oza – Such A Howler! The Great Gatsby (2013) Review by Shivom Oza – ‘Great’ In The Film’s Title Is Justified! Chashme Buddoor (1981) Review by Shivom Oza – Don’t Call It ‘OLD’! Gippi (2013) Review by Shivom Oza - Over-the-top, Yet Delightful! Trouble With The Curve (2012) Review by Shivom Oza – No Troubles With The Film Though! Lessons In Forgetting (2013) Review by Shivom Oza – The Good Kind Of Different!